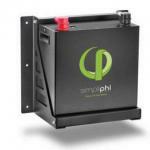 The EVO is a line of robust true sine-wave output inverter/chargers. The 1200 W units have a single AC input, either grid or generator. “–HW” indicates hard wired connections for the AC input and output. The larger EVO units have two AC inputs for grid and generator with priority given to the grid input. Online mode gives priority to the battery and solar input over the grid, connecting to the grid only when the battery is low. Battery charging is based on the batterycondition rather than just charging time. There is external DC charging input terminals for solar charging from a separate solar charge control. This is limited to 50 A, and when used, the inverter will limit its charging from an AC source to the total battery charging limit programmed. 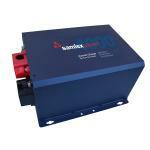 Nine points of internal fault protection ensures reliable operation. Programmable power save mode allows the inverter tosleep when there are no loads, drawing <8 W from the battery. Operating temperature range is -4°F (-20°C) to 140°F (60°C). These inverters are covered by a 2-year limited warranty. Dimensions are 16.4"L x 12.8"W x 5.83"H for the 1200W units and 16.8"L x 12.8"W x 8.15"H for the larger units. 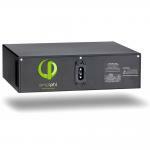 The120 VAC inverters are listed to UL1741 and 458, CSA C22.2 No. 107.1-01, and the export inverters are CE marked.